Went offshore from St. Simons Island fishing with my son, Jeff Jr. We caught a mess of Black Sea Bass and then had the family over for a fish fry. 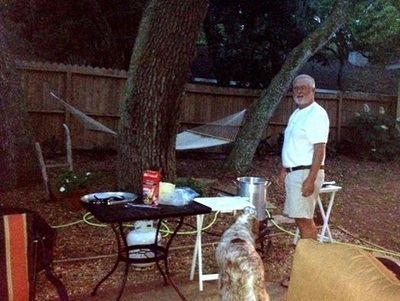 Filet them, then cook them in peanut oil over a propane flame after dipping them in milk and batter. It only take 2 minutes if the oil is at 370 degrees. Nothing better. We will now move inshore for trout, redfish, triple tail, flounder, etc. Let me know if you want additional information. Capt. Tim first began guiding during the 1990s in the Jacksonville area, where he co-founded the Inshore Saltwater Anglers Club and joined a small bass trail on the St. John’s River. 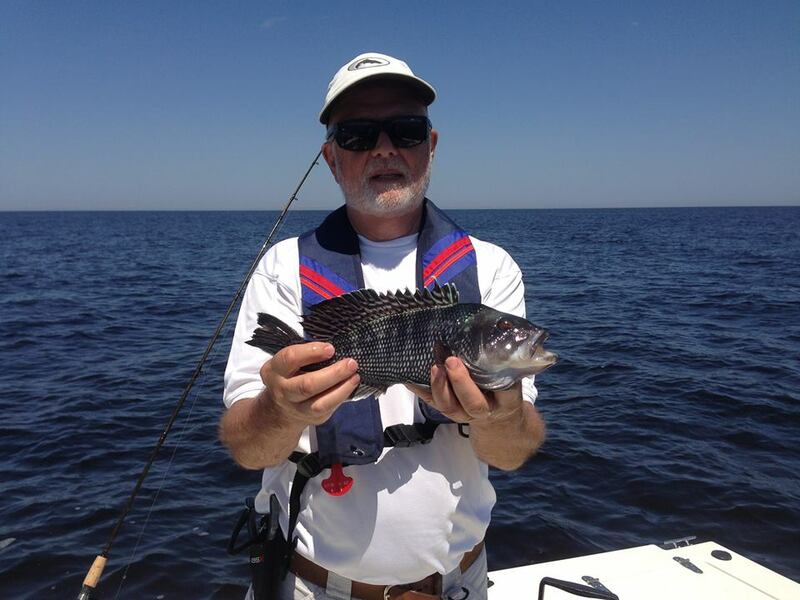 His passion for tournament fishing soon grew, and Capt. Tim spent two seasons chasing King Mackerel in various Southern Kingfish Association (SKA) venues on the East Coast before settling down to focus on inshore saltwater fishing. 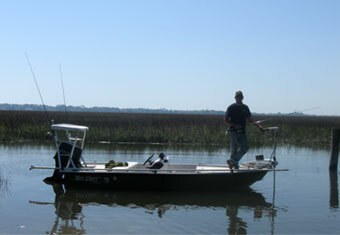 After fishing the pristine marshes of Cumberland, Jekyll and St Simons Islands for several years, Capt. Tim realized that this was the place he would stay. 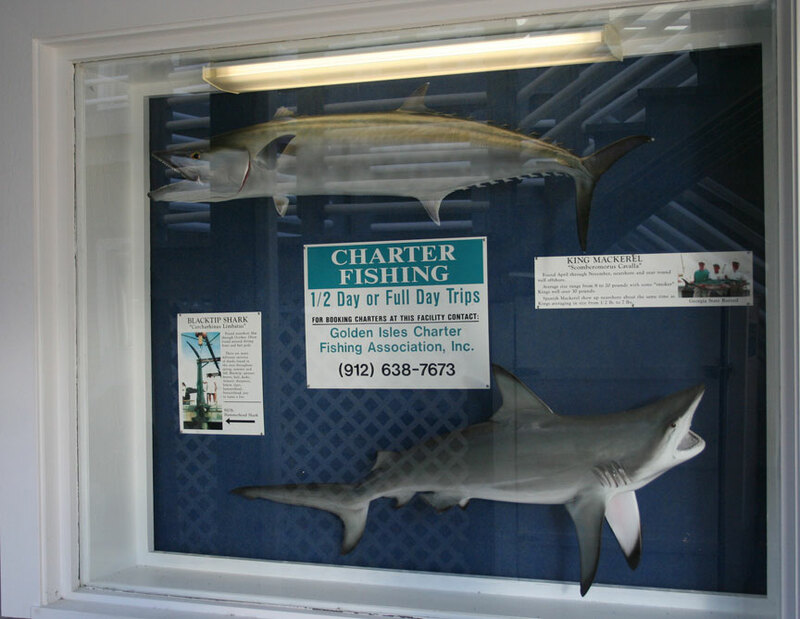 The massive amount of untouched marsh, lack of fishing pressure, world class inshore fishery, and sheer beauty of the Georgia coast makes the Golden Isles the ideal place for any fisherman. To schedule your day of fun, or to discuss special needs or requests. Be sure to follow us on Facebook and Twitter too! 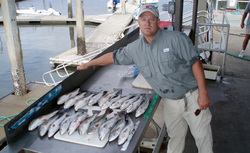 Jeff Williams, Jr., showing off his catch of Sea Trout and Red Fish. 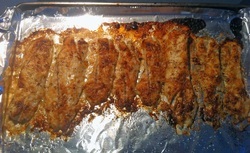 Baked Sea Trout - call Linda for the recipe. 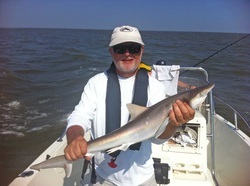 A nice 4 foot shark for catch and release. A great fight on light tackle. A BIG Red Fish (Spot Tailed Bass). This one was over the size you can keep so it went back. 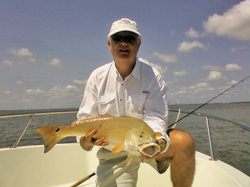 Georgia limit is 5 Red Fish in the slot, so check it out. 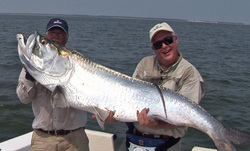 Captain Mark Noble (left) and guest with 125 LB tarpon caught off Cumberland Island.